As I consider this solemn day and its deeper spiritual meaning, I consider how I, as a convert, felt drawn to the Blessed Virgin early on in my faith as a Catholic. There have been many times over the years that I have sensed the need, sometimes inexplicably, to seek Mary’s help and assistance in my life. As I look back on those times I can undoubtedly witness that I received special strength to go through many difficulties that were to come, which I had no way of knowing were laying ahead. Other times, the devotion to Our Lady simply helped me to grow and mature in my faith. Always, it has been the case that being devoted to the mother of my Lord has helped me to know him better. She has shown me her Son numerous times and in many subtle ways. She shows me the love that will lead us to heaven. She shows me the excellent way of prayer. In the Magnificat, from today's gospel, I see the blessedness of humility, which leads to exaltation. In my formation as a Catholic, I was taught to find my “yes” to the Lord somewhere in Mary’s affirmations. In her Assumption we see the sharing of the glory that comes with that yes, while simultaneously seeing the beauty of her exalted humility. Having once been a Protestant, there were occasions when devotions to Mary seemed extrinsic to what I learned as a child. However, a little over two years ago I had a dream in which Blessed Teresa of Calcutta appeared and told me not to be afraid to seek the assistance of Our Lady. When I first converted I looked to Mother Teresa as a model of what it means to be a saint and a servant in the spirit of God’s great love. Moreover, I consider that my prayers, joined to those of the Blessed Virgin, following the dream got me through a very difficult and trying time in events that surrounded my young son, who has autism. In many ways the progress he continues to make is miraculous. I have to say that I felt apprehensive about sharing the dream with you here on the blog, but I feel certain that God gave it to me for a special reason. Truly, we should never fear seeking the help of the one who guided the Lord through his childhood. Certainly, she is our mother too. 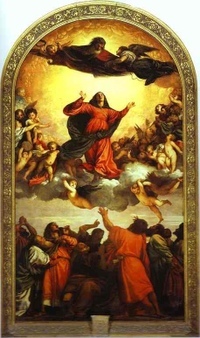 The Solemnity of the Assumption reveals God’s great love for us. It shows us that we are to follow Jesus and his mother into heaven. It shows the joy and crown that awaits those who persevere in faith. Today as we prayerfully and joyfully recall the Solemnity of the Assumption of the Blessed Virgin Mary, I thought it fitting that I share with you a traditional Marian devotion, which I found on what I consider to be a most helpful website. The prayer, or devotion, is the Little Crown of the Blessed Virgin, which was put in its final form by St. Louis Marie de Montfort. To me, it seems very appropriate today. Click here to pray the Little Crown of the Blessed Virgin. I was surprised at how many catechumens in RCIA over the years mentioned Mary having led them to this moment, or of her playing a big part in it, even tho' they were so very unfamiliar with her. I was pleased to respond to the ones who mentioned it personally to me that they had a special blessing I had never experienced. The website for the Little Crown prayer is so helpful, and this prayer is one I've never seen.. I wanted to print it out to pray again later, after my second cup of coffee. Being out of black ink, I selected to print it out in red, the color I thought I still had left, as has been so for many days.. but when I took it from the tray, it was all in deep purple -- color of royalty and of the Passion. Perfect! And being out of paper, I had to print it on the back pages of a holy man's poem-hymn entitled "After this our exile.." Again, perfect. :-) I am most thankful for the other prayers and reflections at the site.